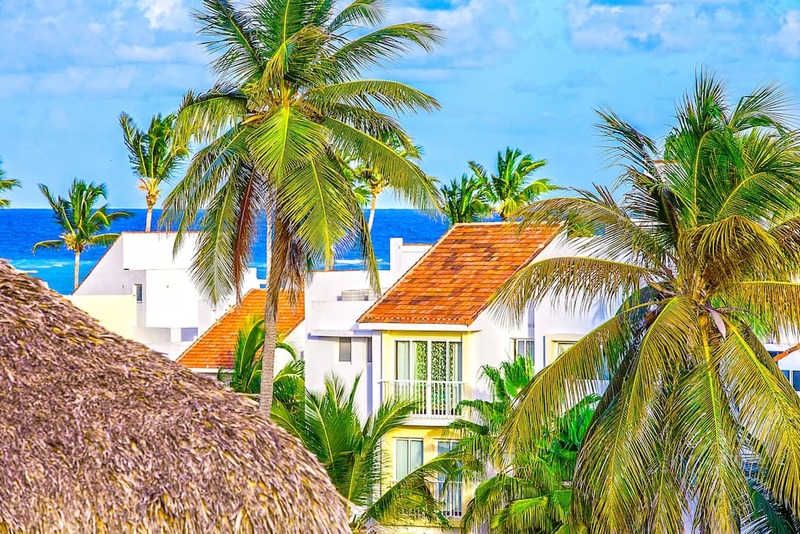 A view from your private observation deck, overlooking Punta Cana area. Welcome to our luxury penthouse with breathtaking ocean views and a few minutes away from the beach. A fresh breeze is what you will feel on the spacious private terrace! Just a few steps down your open terrace will make you feel like the king with your friends, spending an evening here! A large living room on the first level. This is our starting point. This is the place where you will enter in your luxury, private vacation. Enough space for everyone, fresh breeze and amazing views from your balcony. It will make you feel comfortable and independent. The living room. Fresh, spacious, 3 level penthouse will be ideal for your leisure! You can enjoy yourself and have enough space for everybody! Living room. On your left, down the corridor, find the master bedroom. On the first level, you'll find a large living room with a spacious patio overlooking the pool. Here you can be comfortable and jump in the pool whenever you want. Lilac bedroom. Comfortable, super king size bed: 200cm x 200 cm, fresh linen. A kit of fresh towels. Here you can sleep well and enjoy your stay. Every room has a spacious closet so you can store your things. Lamps, ceiling fan, and air conditioner in every room will make your stay comfortable and enjoyable. Punta Cana is the most beautiful place in the world, first-class vacations are the choice of a million of travelers every year! And one more angle to show the beauty of our breathtaking beach which is a 5 min walk from the apartment! A large living room on the first level. This is our starting point. This is the place where you will start your luxury, private vacation. Enough space for everyone, fresh breeze and an amazing view from your balcony. It will make you feel comfortable and independent. Please look at all photos and all descriptions so you'll have a full picture of what you are going to have! Keep looking photos. There are a lot of interesting secret insights there! Large living room on the first level. Enough space for everyone, fresh breeze and amazing views from your balcony. FREE high-speed WI-FI. Enjoy your morning coffee here. Just imagine sitting in a rocking chair and have your coffee or cigar. Amazing view from your balcony towards parking, the common area, and the swimming pool. Lovely kitchen with all amenities: + Water cooler + Kitchen stove + Big Fridge + Microwave + Toaster + Blender It will make you feel like at home! Lovely kitchen with all sorts of amenities so that you can feel yourself comfortable. You can cook and enjoy your food in a neat, fully-equipped kitchen. So, you can have delicious food prepared in this lovely kitchen with all amenities: + Water cooler + Kitchen stove + Big Fridge + Microwave + Toaster + Blender It will make your stay unbelievable! Enjoy your vacation! We can organize all types of excursions, transfers, photo-session etc. for you! Pink (Rose) Room. Comfortable, super king size bed, fresh linen. A kit of fresh towels so that you can sleep well and enjoy your stay. Every room has a spacious closet so that you can store your things. Lamps, ceiling fan, and air conditioner in every room will make your stay comfortable and enjoyable. Bed size 200 cm x 200 cm. It can be divided into two single beds. So, it's going to be very comfortable for you. Unique, private deck with wooden stairs. This is just for you, guys. No other people will have access to it. It's absolutely private! The penthouse where you can take sunbath without leaving your private space. So, here you have total privacy and comfort. Amazing PRIVATE space and sofas made of natural, organic materials make you feel comfortable. Your luxury vacations starts here! Relax in comfortable chairs and enjoy a nice conversation and cocktails with your friends. Airbnb verified photo: "There is a special exquisite bar"
Balcony overlooking the swimming pool. So you can see your friends, kids and family in the pool. And enjoy yourself, your meal and relax! Enjoy your own roof-top spa. Lovely bar view. Here you can have BBQ, music, cocktails and nice time together with your friends. There's a small private area on the 3rd level- we call it the Observation Deck - to sunbathe or chit-chat while sipping a mojito. Getting hungry? Time to BBQ! Organic, coil, kosher BBQ! A full, standalone bathroom. Nearby the BBQ area and the party deck. Lovely private bar view. Here you can have your BBQ, music, cocktails and nice time together with your friends. There's a small private area - we call it the Observation Deck - on the third level to sunbathe or chit-chat while sipping a mojito. Our favorite! Comfortable bathroom with all necessities will help you to enjoy your stay. Comfortable sofa. You can sit together and enjoy yourself with family and friends. Awesome experience for amazing people! Comfortable sofa. You can sit together and enjoy yourself with familiy and friends. Awesome experience for amazing people! The lovely kitchen with all amenities: + Water cooler + Kitchen stove + Big Fridge + Microwave + Toaster + Blender It will make your stay unbelivable! Cooler and kitchen stove. Always fresh and clean water. You need to cook something quick. You have everything you need. + Oil, salt, tea, pepper, sugar at your service. Another angle of the kitchen and the dining area adjacent to the living room. Use this HUGE microwave for a quick bite to eat when enjoying your luxury style vacation. You can put there a Pizza almost of any size! Literally three (3) Min walking to the beach. Five min walking to the supermarket and restaurants. So, you will be at the center of everything! Book it now! Hammocks for kids. Now we have different ones! You'll definitely have fun. Map with attractions. You can use it as a guide. But of course we'll provide you with all information. The map of nearby attractions and places. You can see that we have a really centric position. And you are just 3-5 min walking to get to all places that you need. Here in the Dominican Republic we have regular US sockets and regular plugs. Smoke Detector -Carbon Monoxide Detector. So, you will feel safe! Your private deck .Everything is made with love. You'll see a lot of small details, decorations made of natural wood etc. So, you can be sure that you'll enjoy your stay! Stairs. Special Wood from Canada in order to make sure that you have the best eco materials. There's a small Private area - we call it the Observation Deck - on the third level, to sunbathe or chit-chat while sipping a mohito. Our favorite! A full, standalone bathroom. You can use it while you are on the deck! Wash your veggies for BBQ or take a shower. Additional comfort for you, your family and friends. Our magnificent beach. Book your unique vacation now! Fruit store. Amazing cocktails and always fresh fruits for you and your friends. Punta Cana/Bavaro views. You can enjoy this view every day of your stay! Paradise views are waiting for you in Punta Cana! You can have the best vacation. This spacious three-level penthouse with a hydro-massage tub and an observation deck is an ideal place for an amazing vacation! Close to a white-sand beach with all kinds of activities, restaurants, shops, clubs, it features everything you need: 3 large bedrooms, fully equipped kitchen, private area with a bar, BBQ, and a private deck to sunbathe with stunning views. Start your vacations with a positively reviewed host, as our 900+ guests appreciated our hospitality, the area, and their stay! Imagine this… You get off your plane, arrive at a large 4,096 square feet secure, private 3-bedroom penthouse. You drop off your luggage and head right to your private rooftop balcony with a hydromassage tub (not hot! ), a private bar, and all this overlooking the pool, palms, and Paradise! A stone throws away you find wide, white-sand beaches and international restaurants to your heart’s content. Bars, ice-cream, and world-class shopping, dining, and galleries all within walking distance. And, of course, world-class cigars and cocktails, just a five (5) minutes stroll down the beach. The apartment is set directly on the world-famous Turquesa and Barcelo Beaches in the heart of Bavaro. It features three large, spacious, uniquely styled art-deco bedrooms with great views, that are beautifully arranged to ensure maximum privacy for all guests. The second floor provides a private space for your convenience. Book this Punta Cana exclusive experience. Get access to the two-level Penthouse with a unique private patio and an observation deck, where you can take a sunbath with your friends or family. We provide the service, which is reviewed by hundreds of guests, so you can enjoy totally the most beautiful apartment and remember Punta Cana as an excellent place! 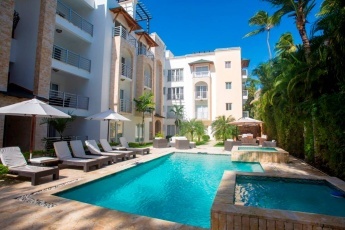 Located within three minutes walking distance from the world famous Bavaro beach. Five! (5) minutes walking distance to the best restaurants in the area, bars, and shops. Do you want more services? Just send me a message! Exceptionally designed rooms and its unique colorful gamma are the most attractive detail, but all the beauty and comfort of this apartment is revealed when you just cross the threshold! The apartment has everything you need to just come, check-in and forget about everything – it’s fully equipped and ready to serve you! Here are high-level details about the space, of all 3 levels. Room by room. Super King size bed – can be divided into 2 single. King size bed – can be divided into 2 single. 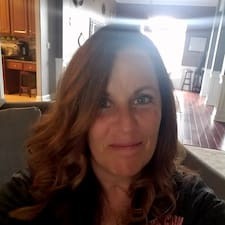 Keep reading and I’ll provide detailed information so you can imagine your unique vacation from the start. And of course, world-class cigars and cocktails, just a 5-minute stroll down the beach. The apartment is located directly at the world-famous Turquesa and Barcelo Beaches in the heart of Bavaro/Punta Cana. We know every spot in the DR and we’ll provide the best conditions for you so that you can have a breathtaking experience!!! 1. It’s super SPACIOUS, with breathtaking PRIVATE deck (terrace). With a great bar and a massage tub (not hot), and of course BBQ and one more private deck. 2. Centric location, it’s located within a 3-minute walk to the beach and a 5-minute walk to all restaurants, coffee shops, bars, money exchange, fruit stands, and 3 mini-markets. 3. It’s perfect for big groups and families. 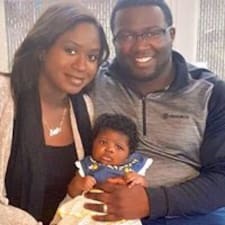 Three things that you may not like. 1. View in residence is not so great as the apartment inside. Right now the HOA manager is working to update the residence. Not a big deal but you can see people painting the fence or upgrading something. 2. The trash barrels in the street on your way to the beach. It’s typical here in the country. If you want to take out some trash you should throw it away into those barrels. 3. Loud music from the hotel nearby. It’s allowed until 11.00 PM. Sometimes you might hear loud music from the hotel nearby especially during New Year, Christmas or other celebrations. Please, inform me immediately if they don’t stop after 11 PM. => Unique, private, lovely vacation – spend time with family and friends in Paradise. Relax and enjoy cocktails at a private Penthouse location with pristine beaches right at your doorstep. A vacation that you will remember for the rest of your life! Upon your arrival, one of my team will meet you personally, will check you in, so you’ll feel comfortable right after your fast and easy check in and know your way around right away. As you step onto the ground floor of the apartment, you see the large living room area. Surrounded by the fresh ocean breeze and bright sunshine entering through the wide balcony doors. Overlooking a resort-style swimming pool. Next to the living room, you find a beautifully arranged open-plan, dine-in kitchen. The kitchen is fully equipped with quality appliances. Full-size fridge, and everything else you need for a perfect stay. Also, on the first floor, there are privately separated uniquely decorated bedrooms. The master bedroom features a large king-size bed. Plus, your own bathroom, beautifully decorated with local sandstone tiles. Bedrooms: 2 (lilac) and 3 (pink) share another magnificently tiled spacious bathroom. Every bedroom is equipped with a large, super king-size bed which can be divided into two single. Every bedroom is separated from the others. A set of decorated with Colonial style stairs leads up from the living area to the spacious entertainment deck. The entertainment deck is furnished with a bar, wood barbecue, hydro massage pool (not hot), and a 3-rd bathroom. All features that are necessary for unforgettable holiday parties. Overlooking the pool, with a sea breeze and fresh air. In your private space, open, protected from the sun and rain with a smart, yet cozy roof design. Another private, secluded level up that you can enjoy your observation deck. It’s perfectly suited for sunbathing and observing the pool. You have two chaise-lounges on the rooftop to sunbathe. Included free of charge are the high-speed wireless Internet, house phone, cable TV service, and an HD Flat Screen TV. Upon check-in with me or one of my team (we will meet you at the main gates), you will receive all information about all possible activities. I will help you familiarize with all the features of your penthouse to make it your perfect vacation. Do not hesitate to send me a message in case you need something. You’ll be provided with dish towels, paper towels, dishwashing soap, refuse plastic bags, laundry detergent, and more to make your stay comfortable right from the start. Let us know the approximate time of your arrival, or let us organize a transportation for you! With me, you’ll receive more because we know all pitfalls and options so we can combine things and provide more added value. Book your unique vacation in Punta Cana with me and you’ll receive additional information and premium local guidance. We organize everything from excursions to private events, and transportation. Let us know about your priorities. The best secret options for your vacation – just ask us for tips and information. >>OUR SPECIAL<< For our guests, We organize a FREE excursion to Don Lucas (upon request and availability) - Factory with Luxury Cigars, Premium class Coffee, and natural chocolate, and RUM that you can enjoy and taste everything, and of course, you can bring some gifts to your family and friends. Welcome to Punta Cana… The World-famous, unique white sand beaches and exceptional Caribbean experience are waiting for you! 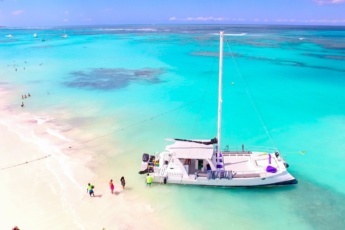 International cuisine restaurants, bars, stores, clubs, and, of course, the best white-sand beaches and the sea, where you get an unforgettable experience of parasailing, scuba diving, snorkeling, kitesurfing, – everything is within walking distance. Just enjoy your stay! There is a gym nearby. Just ask us for directions, as you are steps away to your health! 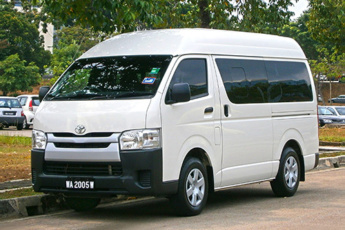 There are plenty of taxi services; however, you can organize your transportation with us or rent a car. We have different options for you. 5-minute drive to a golf course. I'm happy that I've planed my vacation with this team. Very lovely place, comfortable apartments, friendly and polite people. Additional thanks to Anna who knows so much about DR and helped us with excursions. It was unforgettable! 5/5 Recommend! This is my second time at vasily's properties and they make everything easier for me, Vasily and his team are always attending any request you have, defenitely i will come back. The property is in good condition, beautifull and clean. Василий, спасибо за теплый прием и организацию нашего отдыха в Доминикане. Апарты в прекрасном виде: чистенько, прибрано, все по красоте для спокойного отдыха. Есть все. Спасибо! Замечательный и добродушный владелец апартаментов Василий, предоставил максимальный комфорт и сервис. Моментальная связь, полная поддержка, уютные апартаменты, кристальная чистота! Уверен, что воспользуюсь его услугами снова. Мои наилучшие рекомендации и благодарность! If you want have great vacation this place for you. Perfect and friendly service help to make choices because to many restaurants and bars. Just in minutes you access to Turquesa plaza. Very nice apartment and good location gold beach warm ocean all components to make perfect vacation. Recommended for all. Punta Cana is amazing. Anna who cohost/manages the location is greatest additional. She know so much about Punta Cana. Thank you. What Punta Cana beach can you recommend for a perfect Punta Cana vacation? 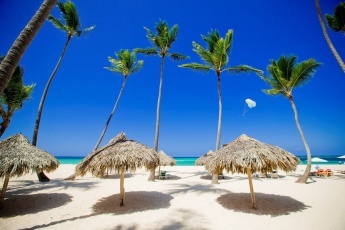 All the beaches are great for a perfect Punta Cana vacation. 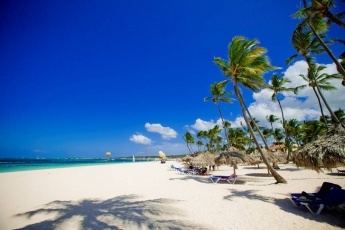 Punta Cana and Bavaro are considered among the best 10 beaches in the world. 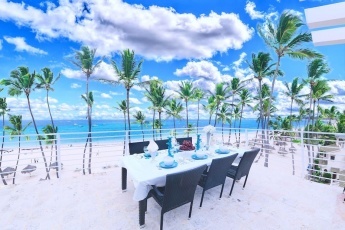 Book this Punta Cana private beach penthouse and enjoy your Punta Cana beach vacation. 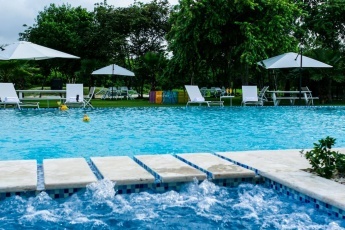 Is this Punta Cana vacation rental good for Punta Cana family vacation? 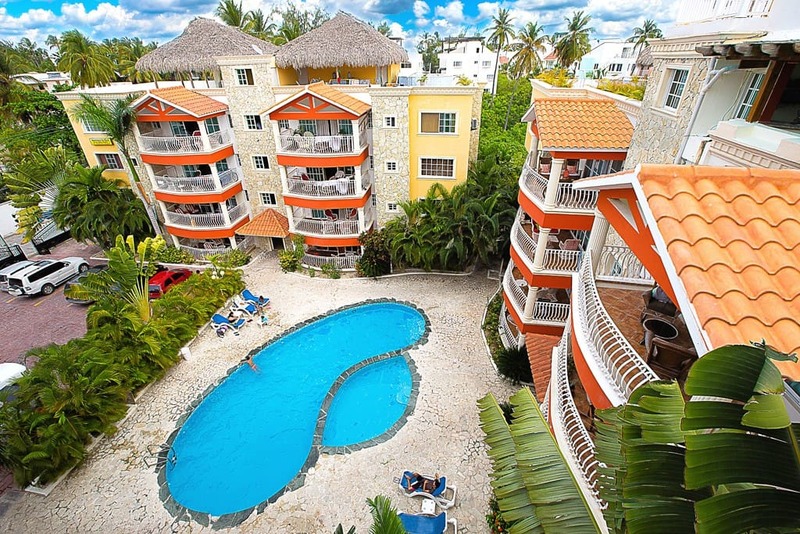 Yes, this Punta Cana vacation rental is a well-located and spacious apartment of 3 bedrooms. It's perfect for your Punta Cana family vacation. Our Punta Cana penthouse is located in a complex gated and protected by 24/7 security. To make your stay in Punta Cana safe and secure, you have secure parking. Yes, this Punta Cana vacation rental is a kid friendly resort in Punta Cana. It is good and very comfortable for families. Is the international airport Punta Cana far from Punta Cana penthouse? Our Punta Cana penthouse is 20-minute drive from the international airport Punta Cana. We provide personalized service in Punta Cana. Contact us in advance to reserve your private transportation. Is the water safe to drink in Punta Cana? We still advise to drink bottled water as a precaution. In our Punta Cana family rental you will find a water dispenser. Spanish is the official language of the Dominican Republic. But at our Punta Cana family rental we speak English, so that you will feel free to communicate. Is it advisable to rent a car in Punta Cana? This Punta Cana penthouse is 3 min walk to the ocean and 5 min walk to Punta Cana restaurants and bars. Actually you do not need to rent a car. What is Punta Cana typical food that I should try? Our Punta Cana family suite is 5 min walk to Punta Cana restaurants, so that you should try Sancocho – a soup of pork, beef and chicken along with a variety of local vegetables such as maize, plantains and yucca. Mangu- green plantains served as the base of the dish, topped with sautéed onions, eggs, salami or cheese. Mofongo - fried plantains as its main ingredient with fish or meat. Try cassava bread and queso de hoja (a kind of cheese). And do not forget about avocados and delicious desserts of tropical fruits. What is the best time of year to go to Punta Cana? The most popular travel season to Punta Cana falls on the months from December to March, July and August. But you can book this Punta Cana family suite for any date you like, because the weather is fine and it is about 30 degrees Celsius all year round. What are 10 things to do in Punta Cana? We provide personalized service in Punta Cana. Your personal concierge at Punta Cana penthouse will help you with the entertainment according to your priorities. 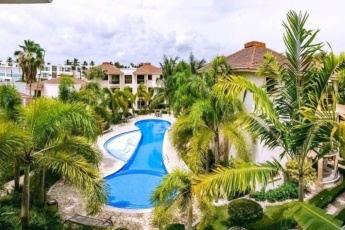 What kind of apartments in Punta Cana is this Punta Cana vacation rental? Our Punta Cana vacation rental is a 3 bedroom condo Punta Cana, located 3 min walk from the ocean. What type of Punta Cana vacation rentals is Punta Cana penthouse? 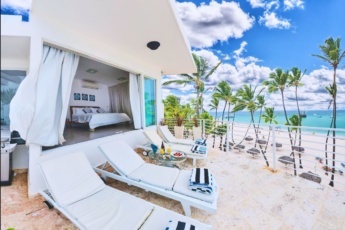 Our Punta Cana penthouse is a Punta Cana beach apartment, located just 3 min walk to the ocean.